Yet successive American administrations-Republican and Democratic alike-have misread the intentions and actions of the Iranian regime. * Iranium documents the development of Iran's nuclear threat, beginning with the Islamic Revolution of 1979 and the ideology installed by Supreme Leader Ayatollah Khomeini. * Iranium tracks Iran's use of terror as a tool of policy, beginning with the 444 day seizure of the U.S. Embassy in Tehran, through Iran's insurgent actions in Iraq and Afghanistan. * Iranium details the brutal nature of the Iranian regime to its own citizens, and the Iranian people's desire to rejoin the international community. * Iranium outlines the various scenarios the greater Middle East and the Western world may face should Iran cross the nuclear threshold. 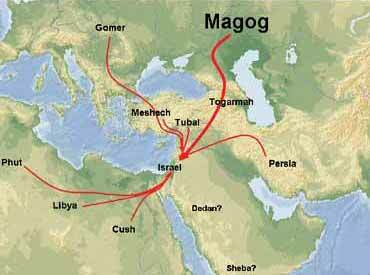 Ezekiel Chapters 38 and 39 describe a future event in which God Himself intervenes to quell the ill-fated invasion of Israel by Magog and its allies (Persia, Cush, Phut, Libya, Gomer, Togarmah, Meshech, and Tubal). This passage also appears to anticipate the use of nuclear weapons. While there is slight debate among bible scholars, the above list represents the following: • Magog - this is modern day Russia • Persia - this is modern day Iran • Meshech and Tubal, Togarmah - this region is modern day Turkey • Ethiopia - this is modern Ethiopia • Libya - this is modern day Libya • Gomer - this is modern day Germany. Suffice to say that the main players, of which there is no doubt, are Russia, Iran, Turkey, Libya and Ethiopia. Israel indeed has two major world wars on it's horizon, and the bible refers to this as the "time of Jacob's trouble". While the nations gather together, Israel's back will be pushed to the wall, and its resolve and endurance to the breaking point...BUT God will save His People out of this time of calamity, and He will fight for them. The battles have yet to be fought, but the outcome has already been decided.